Some new stuff, some old stuff – what are you watching tonight? ABC will air an all new news special about the Earthquake Crisis in Haiti. Over on CBS, there’s a rerun of THE MENTALIST where the team investigates a haunted mansion. NBC has all new episodes of COMMUNITY and PARKS AND RECREATION. On COMMUNITY, Jack Black guest stars as a student who has a little obsession with Jeff and might join the group while Jeff becomes editor of the Greendale Gazette; on PARKS AND REC, Will Arnett (Amy Poehler’s real life hubby) guest stars as a blind date for Leslie. BONES is all new on FOX – Brennan and Booth head to New Mexico to investigate a UFO and Angela and Wendell reveal their relationship. Over on The CW, catch a rerun of THE VAMPIRE DIARIES – this is the fall finale where Stefan and Elena make up,and then she leaves when she realizes she looks exactly like Katherine. ABC has an all new episode of GREY’S ANATOMY – the first hour of the two hour GREY’S/PP crossover that has Marc seeking Addison’s help for Sloan’s pregnancy. An all new episode of CSI airs on CBS – 2 women are found in a hotel and they find out more on Dr. Jekyll. An all new episode of FRINGE airs on FOX. The gang investigates horrible deformities in upstate New York. NBC has two all new episodes of 30 ROCK. Up first, there’s a New Year’s Eve celebration and James Franco guest stars as himself, as he embarks on a set up relationship with Jenna. The second episode sees a relationship I didn’t know existed goes further and Jack isn’t happy. The episode of SUPERNATURAL that aired as the fall finale (where Jo and Ellen sacrifices themselves airs on The CW. ABC continues the crossover with an all new episode of PRIVATE PRACTICE that has Marc and Sloan heading to LA. An all new episode of THE MENTALIST airs on CBS – they investigate at a high school reunion, and Rigsby goes undercover as an alumnus! As always, NBC has LENO. You’ll find an all new episode of REAL HOUSEWIVES OF ORANGE COUNTY on Bravo. 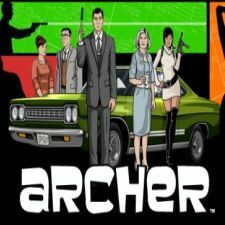 Check out the series premiere (and second episode) of one of my new favorite shows, ARCHER, on FX. You must watch this insane animated series with a totally awesome unique voice. Over on Lifetime, PROJECT RUNWAY starts – they’re back in New York this season!